Steel construction for long lasting durable use. Includes (4)- 4" swivel casters (two locking) for easy mobility. Pull out shelf usable from the front or back for extra space that can be hidden while not in use. Locking security cabinet to securely hold valuable equipment while not in use. 1- Neoprene mat included to keep equipment in place. This rolling AV cart has a pull out shelf measuring 19-3/4"w x 173/4"d. This feature is ideal for holding a laptop or projector for presentations and then hiding it underneath when not being used to save space. 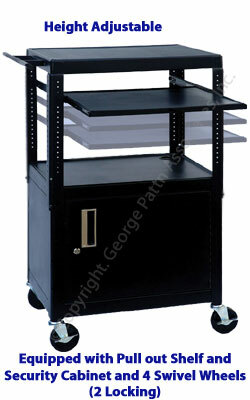 This steel rolling AV cart, also known as a utility storage workstation, is constructed for durablity. This projector holder has a mat so equipment stays in place. This locking cabinet rolling AV cart is great for storing equipment when not in use. This display workstation can hold items in the secure cabinet to pull out and utilize for presentations. This utility trolley, rolling AV cart that is powder coated black is sleek and fits into nearly any environment. This classroom workstation includes a UL listed 15' power cord with 4 outlets to plug in any utility. 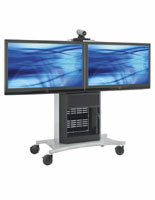 This rolling AV cart has a height adjustable top shelf from 26"h to 42"h in 4" increments. This display is ideal for classrooms or offices. This rolling AV cart is height adjustable to suit the user or the need of a projector. 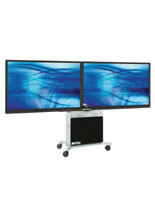 This display is one of many lcd workstations available in this online catalog. 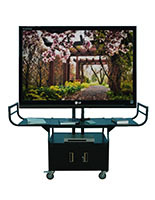 This rolling AV cart can be used as a classroom utility station. This trolley has an optional handle to push or pull. This rolling AV cart that has 4" wheels moves around a room easily and can be rolled to different rooms in an establishment. 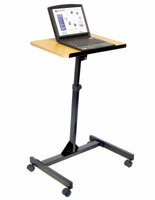 This display trolley can be used to hold a laptop, presentation materials, dvd players, projectors, and more! 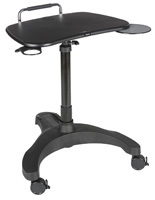 This lcd utility workstation is made of durable steel with a black powder coated finish. This trolley for a projector makes presentations simple and convenient. Two of the four caster wheels lock into place for a stable stand. This workstation ships unassembled to save on shipping costs. This unit has an optional handle for easy pushing or pulling. Manufacturer model# FSCAB4226E.